The 2009 Oregon Pinot Noirs might not be as appealing as the 2008 Oregon Pinot Noirs for the hard-core pinotphile, but they have found many fans among consumers. It is an early drinking vintage that will not have the aging potential of the 2008 vintage. An ideal spring led to a large fruit set but the summer was hot and in conjunction with early September rains, brought mold to some vineyards. Warm temperatures in September and October led some growers to pick late and the wines, although exuberant, showy and luscious (think Caliesque), ended up high in alcohol. The vintage was reminiscent of 2006 for some producers. One will need to tread carefully if your tastes run to more classical Oregon Pinot Noir, choosing those producers who picked earlier and cropped properly. The Antica Terra (“Old Earth” in Latin) vineyard, first planted in 1989, was purchased in 2005 by three friends and partners along with winemaker Maggie Harrison, a long time former assistant winemaker to Manfred Krankl at Sine Qua Non in Ventura, California. 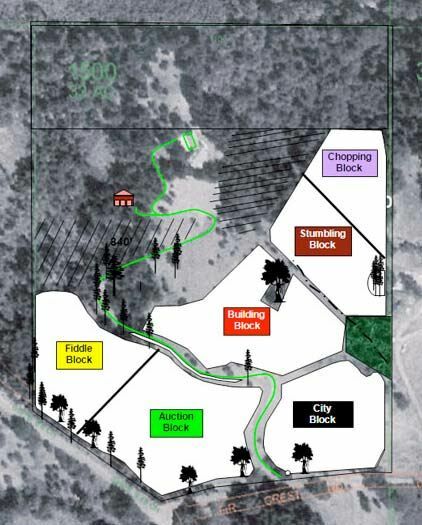 The 26-acre estate vineyard is situation in the Eola-Amity Hills appellation. The inaugural Willamette Valley release under Harrison was the 2006 vintage and the wines have been outstanding from the inaugural vintage. The vineyard had to be upgraded and additional plantings put in place, so about 50% of the grapes were sourced from other vineyards initially. For 2009, the following wines were scheduled for release in 2011: Willamette Valley Chardonnay and Estate Grown Pinot Noir (November 1, 2011), Erratica Rosé, Willamette Valley Pinot Noir, and the limited release Botanica (includes fruit from Shea Vineyard), the latter three April 1, 2011. The wines are sold through a mailing list with some distribution through retail channels. A new winery was completed in time for the 2009 harvest in Dundee. Vineyard tours and tasting are available by appointment (503-244-1748). The website is www.anticaterra.com. 13.5% alc., $50. A blend of estate fruit with grapes from Shea, Old School, Cherry Grove, Johan and Bliss vineyards. Aged in 50% new French oak barrels. · Moderate reddish-purple color in the glass. Black cherry based aromas and flavors lashed with a noticeable oak presence of char, tobacco and coffee, but offering nuances of earth and grilled mushrooms. Creamy and silky, with firm but supple tannins, and a pleasing aromatic finish. Better the next day from a previously opened and re-corked bottle. Will benefit from time in the cellar. Good (+). See description under first feature in this issue. Owner Steve Lutz says the 2009 vintage wines should be consumed within 4 to 5 years. The 2009 wines have higher alcohols, less intensity of flavor, and are more forward than their 2008 brethren. That said, these are very nice wines to drink while you wait for the 2008s to mature. The higher alcohols do not intrude unless the wines are allowed to warm to room temperature. 14.8% alc., $30. 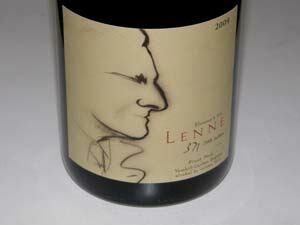 Entirely estate fruit with same yields as Lenné Estate Pinot Noir. All five clones planted at Lenné. · Moderately light reddish-purple color in the glass. Aromas of spiced dark red berries and cherries with a slight roasted character and a hint of old book. 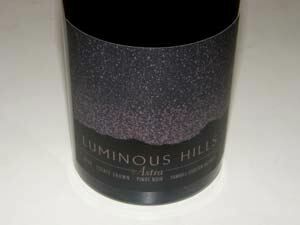 Discreetly concentrated core of dark red berries with underpinnings of anise and Asian 5-spice. Welcoming elegance, ending with a trace of heat. Good. 14.8% alc., $45. A selection of best barrels and primarily clones 115 and Pommard. · Moderately light reddish-purple color in the glass. 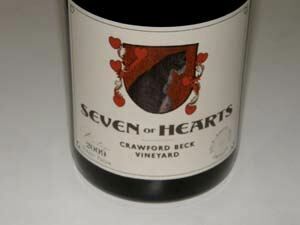 Highly aromatic with notes of dark red cherries and raspberries, baking spices and sandalwood. Crisp and juicy flavors which mimic the aromas. Not the intensity of the 2008 vintage, but more approachable and currently very satisfying. Nicely crafted. Very Good (+). 15.4% alc., 49 cases, $55. From the most stressed portion of the vineyard with shallow, nutrient poor soil. Clone 667. · Moderately light reddish-purple color in the glass. Subdued nose with reticent aromas of dark red fruits, mushrooms and wet earth. Well-endowed and noticeably rich with flavors of dark strawberries, dark raspberries, and a kick of citrus on the finish. Smoothly textured with firm but supple tannins. A ripe, big gulp of Pinot in a Caliesque style. Will have fans. Good (+). 14.8% alc., 49 cases, $55. · Lightly colored in the glass. Subdued aromas of crushed red berries and baking spices. Elegantly crafted with charming flavors of dark red cherries and berries, sassafras and a slight candied, even cotton candy tone. Soft, supple tannins make for easy drinking. Very Good (-). 15.4% alc., 49 cases, $55. First bottling of 114 clone. · Moderately light reddish-purple color in the glass. Enjoyable perfume of delicate red fruits. Red-fruited with hints of savory oak, spice and dark chocolate, with an appealing velvety mouth feel. Elegantly styled and easily approachable. Leaves a little heat in its wake on the finish. Good (+). These wines are the work of Byron Dooley, who, along with his spouse Dana, escaped from Silicon Valley during the internet bubble of 2000. Arriving in Napa Valley, Byron earned his viticulture and winemaking degree at Napa Valley College. After an internship at Williams Selyem, he made his own Bordeaux-styled wine from Napa fruit. 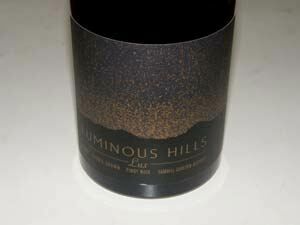 In 2004, the couple acquired a property in the Yamhill-Carlton District and developed a 11.2- acre estate vineyard named Luminous Hills. Two labels were started: Seven of Hearts and Luminous Hills. Dana opened Honest Chocolates in McMinnville selling traditional style chocolates. Later, a second branch was opened in Carlton which shares space with the Seven of Hearts and Luminous Hills Tasting Room. 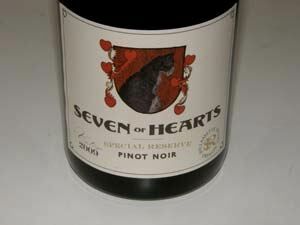 Seven of Hearts is about exploring vineyards in Oregon’s Willamette Valley and neighboring regions, featuring distinct appellations and in some cases, unique vineyards, as well as other varieties along with Pinot Noir. The label’s neoclassical elements symbolizes the winery’s passion for the traditional Burgundian style of Pinot Noir. The winemaking approach for Seven of Hearts and Luminous Hills is the same using traditional methods such as native yeast fermentation, whole cluster fermentation when appropriate, minimal handling and additions, and largely no fining or filtering. 13.8% alc., 630 cases, $20. Released February 1, 2011 via tap program in Portland restaurants, May 1, 2011 in bottles. Sourced from five vineyards in three appellations. Pommard, Wädenswil, 777, 667 and 115 clones. 12% whole cluster, native yeast fermentation, 23% new French oak barrels, unfined and unfiltered. · Moderately light reddish-purple color in the glass. Hint of volatile acidity which lessens over time. Scent of spiced red berries and a hint of new oak. Flavors of red strawberries and cranberries and cherries with savory herbs. Bright acidity and mild tannins. A daily drinker. Decent. 14.5% alc., 98 cases, $35.Released May 1, 2011. 100% clone 115 from a single vineyard with volcanic soils. Native yeast fermentation, aged in 23% new French oak barrels, unfined and unfiltered. · Moderate reddish-purple color in the glass. Aromas of dark red fruits including strawberries, polished wood and cut flowers. Tasty essence of darker red berries and cherries with a subtle note of anise and a riff of citrus peel on the finish. Soft in the mouth with supple tannins and bright acidity at the end. Good. 14.0% alc., 147 cases, $42. Released May 1, 2011. 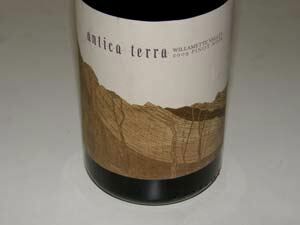 From four vineyards in three appellations (including Luminous Hills) and both volcanic and sedimentary soils. Clones 114, 115, 667, 777, Pommard and Wädenswil. 33% whole cluster fermentation, native yeast fermentation, aged in 23% new French oak barrels, unfined and unfiltered. · Moderately light reddish-purple color in the glass. Nice array of aromas including fresh cherries, red currants, spice and a hint of vanilla. Cherry pie filling is the theme with crisp acidity, firm tannins and a lingering presence of perfectly ripe fruit on the finish. Very ephemeral in the mouth. Very Good. 15.0% alc., 357 cases, $28. Released February 24, 2011. Clones 667 from higher elevation volcanic Jory soils on the site and 115 and Pommard clones from the lower elevation sedimentary sites. 20% whole cluster fermentation (including 100% whole cluster Pommard), native yeast fermentation, aged in 23% new French oak barrels, unfined and unfiltered. · Moderately light reddish-purple color in the glass. Aromas of summer red fruits with hints of cedar and rose bouquet. Light on its feet, with tasty red berry and cherry flavors, complimentary oak highlights, and an aromatically floral finish. A discreetly composed and charming wine. Very Good. 15.0% alc., 98 cases, $35. Released May 1, 2011. Released February 24,, 2011. 60% clone 667 from higher elevation volcanic soils and 40% 115 from lower elevation sedimentary soils. 60% whole cluster, native yeast fermentation, aged in 23% new French oak barrels, unfined and unfiltered. · Moderately light reddish purple hue in the glass. 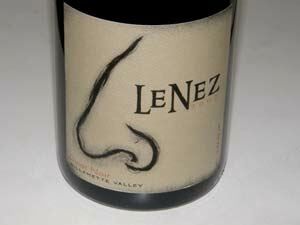 Very shy nose with demure aromas of red stone fruits and spice. A carnival of charming black cherry and black raspberry fruit floods the palate and brings it to attention. This is one of those wines that you taste and then just look at the glass, astonished that such flavor could originate from the liquid in the glass. Clean and polished with an ephemeral presence, ending with a generously fruity finish that leaves a touch of heat in its wake. 15.0% alc., 147cases, $35. Released February 24, 2011. Primarily Pommard clone from the lower elevation sedimentary soils (66%) with 777 from the higher elevation volcanic soils in a supporting role (33%). 50% whole cluster fermentation, aged in 23% new French oak barrels, unfined and unfiltered. · Moderately light reddish-purple color in the glass. Flamboyant aromas of fresh red berries with Asian 5-spice. Well-endowed flavors of dark red cherries and berries with a firm tannic backbone. Similar to the ASTRA but more darkly fruited. Impressive persistence on the memorable finish. Despite the high alcohol, the fruit is neither over ripe or roasted in character. Very Good (+).